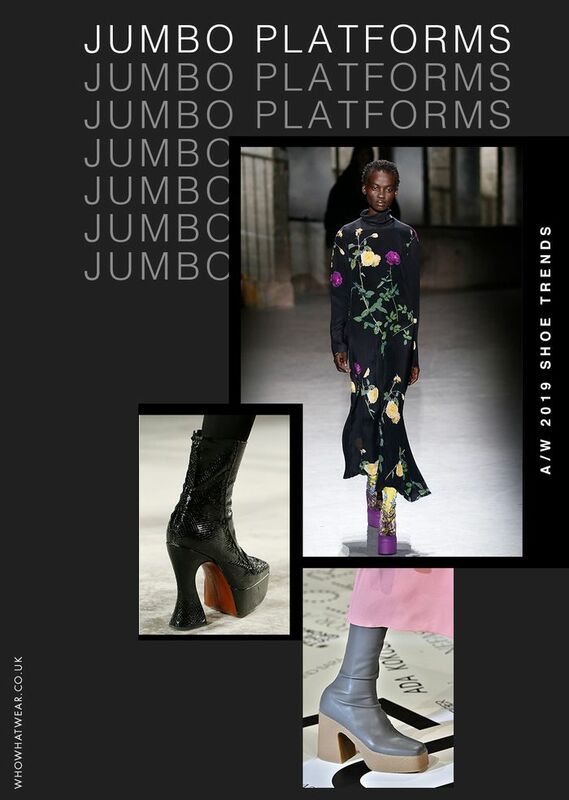 More ’70s glam rock than twee ’40s, platforms are back—and they’re big, stompy things for autumn/winter 2019. Some are elaborate (see Dries Van Noten’s purple-soled floral boots) while others are very plain in order to go with everything (see the curvaceous black mock-croc platform ankle boots from AlexaChung), so even if you’ve not considered yourself partial to this kind of elevation in the past, your mind might be changed this time around. This may not seem like a trend to you or I (because who doesn’t own a pair already? ), but when one shoe is so omnipresent across the fashion capitals, it’s important to take notice. As basic or as complex as you like, a pair of black ankle boots in any guise will serve you well this season and forever more. We’re particularly keen on wearing a chunkier style, like Bottega’s pull-on bikers. Perhaps the most decadent of all the coming season’s new shoe trends, plumage has become a favourite trim for many designers. In equally fabulous colours, you’ll find feather adorned sandals, courts and boots across the runways. They’re clearly being positioned as the go-to party shoes of the future. If there’s a highlight colour to be recognized for A/W 19’s footwear lineup, it’s red. If you already bought into the trend two years ago, well done—whatever style or finish you invested in will still stand up for the rest of the year, if not longer. Love your kicks but find your ankles get a bit chilly in the colder months? Have we got an answer for you! Sneaker-boots have been bubbling up in streetwear circles for some time (with styles even already reaching the likes of Zara), but it’s now that the look feels like it’s filtering into the mass market proper. Prada’s are, of course, the most avant-garde and highly likely to make appearances across Instagram ASAP. Carrie Bradshaw would be proud. Next season is all about wearing tights with your favourite strappy sandals. The look has already seized my Instagram feed, and I discovered that some hosiery brands do offer tights with extra grip on the soles for this very purpose. Get creative, or simply opt for your go-to 40 deniers in black. A ’90s shoe trend grown-up women will feel less allergic to: square-toed shoes, sandals and boots. These have been slowly but surely making their way back up to the top of the footwear tree. It all started with cult under-the-radar shoe brands but has now hit the mainstream market, with Bottega Veneta and Proenza Schouler showing them on the catwalk. Fashion’s love affair with all things fluffy continues, but rather than shearling and other similar snuggly fabrics being used to line the inner layers of cosy winter boots, we’re seeing it transposed to the outside as a statement. We can’t guarantee these will be the most rain-proof shoes you’ll ever own, but they might just be the most fashion-forward. Continuing on from the recent resurgence for cute front-strapped Mary Janes, designers have taken an even more adorable turn for autumn/winter 2019 with cute finishes (pink and glitter) and easy-to-walk-in heels. If the thought of another pair of basic black boots (see above) is enough to prompt a long yawn, then be cheered by this happy new trend. Floral fabrics are being used for knee-highs and ankle styles, with a noticeable preference towards chintzy tapestry-style blooms. Perhaps these designers have been watching period dramas on repeat?